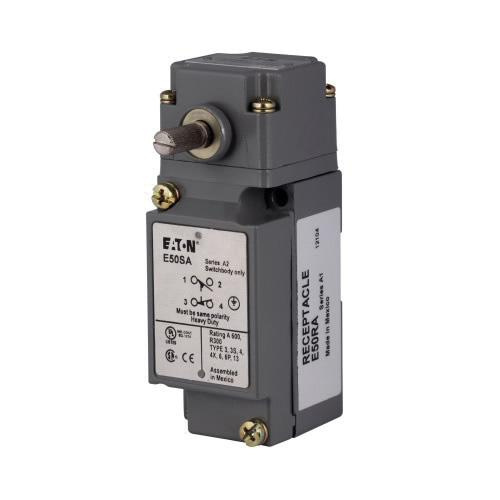 Eaton E50 Series Plug-in assembled limit switch provides application flexibility, reduced inventory and less downtime. This switch takes physical and environmental abuse of harsh industrial environments. Switch is perfect for industrial, maintenance, repair and automotive use. This switch with side rotary actuator, has 10-Amp current rating at 120/240/480/600-Volt AC, 1-Amp rating at 125/250-Volt DC. It has ridge-topped contacts and wiping action that ensure continuity to even logic-level circuits. Limit switch is UL listed, CSA/CE certified and meets IEC/TUV standards.